Where the Muse points, you shall go. I was in my local library Sunday and saw this volume* displayed on the wall. I was immediately drawn to the book by the face on the cover; also thinking, at first, that it was Harry’s tousled Senator Jim Lane. By the time saw it was otherwise, it was too late: the book was in my hand and I was browsing. The man on the cover is one of America’s first photographers, Robert Cornelius, from an 1839 daguerrotype self-portrait. He obviously wasn’t worried about his hair either. So much for the chase. How about the catch? What did I find in this lovely picture book? “the fight in the cornfield; the Irish Brigade driving the rebels out, on the right wing “. If he drew this action in The cornfield and “right wing” is correct, then these men are probably not of the Irish Brigade. If, instead, it’s a cornfield near the Bloody Lane, then “right wing” is wrong. Lumley was apparently confused. Or perhaps eager to see fellow Irishmen wherever he looked. Or maybe he wasn’t actually on the spot. In any case, he was not new to the Army of the Potomac that September of 1862. He had been with the Army as special artist for Frank Leslie’s Illustrated Newspaper [article about] since at least December 1861, and was probably in the employ of a competitor, the New York Illustrated News by Antietam. I don’t know much about Arthur Lumley’s personal life, but after the War he continued to make art in the US, England, and Europe as a book and periodical illustrator and fine artist. What a treat for me, to find this Antietam scene just by chasing that intriguing face. I have altered the sketch a little to make it easier to see. The original is at the Library of Congress. I’ll add this to the AotW battle illustration gallery asap. Lumley’s other wartime images in the online collection at the Library of Congress cover the period from late 1861 through the Fredericksburg Campaign of December 1862, so it seems fair to assume he was with the AoP for at least that long. Biographical information and pointers to his art from askart. *The book Eyes of the Nation: A Visual History of the United States (1997) is something of a “greatest hits” collection of images in American History from the US Library of Congress, and has hundreds of other fascinating pictures, both sweet and sour, spanning the last 400 years. I warn you not to pick it up. 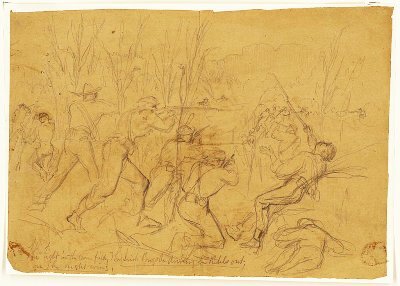 I discussed this sketch with Sussanah Bruce, author of “The Harp and the Eagle: Irish-American Volunteers in the Union Army 1861-1865”. She and we were just as confused about the sketch and its caption, and I think ultimately she had enough doubt to not use the sketch in her book. I think that it is more likely that Lumley was confused about the wing than the brigade. 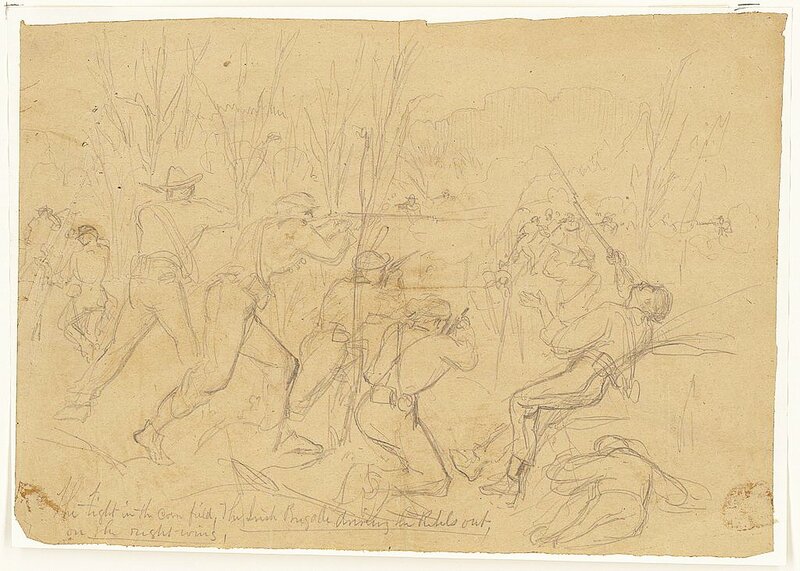 The sketch also appears in Russ Pritchard’s book on the Iron Brigade. For what it’s worth, his caption says “showing elements of the Irish Brigade charging across the Roulette Farm fields, assaulting Confederate positions in the sunken road adjacent to the Piper cornfield, defended by the North Carolina Brigade, about mid-morning, September 17, 1862”. I’m not sure how he could be so certain. Also, IIRC the LOC originally credited this sketch to Waud. In the above, the Pritchard book is on the Irish Brigade, not the Iron Brigade. Thanks for the extra perspectives, Harry. I don’t know what Lumley’s caption tells us, either, but Mr Pritchard’s take does seem a stretch.